Close Close Overlay Begin additional benefits overlay content. You'll see your rewards balance during checkout at Amazon.com. Use your rewards to pay for part or all of your purchase. There's no minimum rewards balance to redeem. Amazon.com Gift Cards: Upon approval of your Amazon Rewards Visa Signature Card application, the Gift Card will be loaded into your Amazon.com account. The Amazon.com Gift Card is only awarded to new cardmembers and at the time of card approval. The Gift Card cannot be used for other gift card purchases. Amazon.com Gift Cards are issued by ACI Gift Cards, Inc., a Washington Company. See www.amazon.com/gc-legal for complete terms and conditions. If you respond via the Internet, the majority of applications are responded to in less than 60 seconds. Your actual response time may vary depending on the Internet connection and volume of submitted requests. We may not be able to give you an immediate answer in every instance. Accounts subject to credit approval. Restrictions and limitations apply. Amazon Rewards Visa Signature credit cards are issued by Chase Bank USA, N.A. Offer subject to change. Rewards Program Agreement: For more information about the Amazon card rewards program, view the latest Rewards Program Agreement. We will mail your Rewards Program Agreement once your account is established. If you become a Chase Online customer, your Rewards Program Agreement will also be available after logging in to chase.com. The terms of the Rewards Program Agreement apply to the 3% Back and 5% Back earned at Amazon.com and Whole Foods Market including physical Whole Foods Market store locations, 365 stores, and the website accessible at wholefoodsmarket.com. % Back and Points: "% Back rewards" are the rewards you earn under the program. % Back rewards are tracked as points and each $1 in % Back rewards earned is equal to 100 points. You may simply see "% Back" in marketing materials when referring to the rewards you earn. Eligible Prime memberships only apply to Amazon.com accounts (and not accounts on any other affiliated websites outside the U.S.) and may include, in Amazon's sole discretion: annual and monthly Amazon Prime subscriptions and members of their Amazon Household (excluding Amazon Prime Video and invited guests of an Amazon Prime account), Amazon Prime Fresh, Amazon Family, Amazon Prime Student and trial memberships of Amazon Prime. How you can earn points: You'll earn points when you, or an authorized user, use an Amazon Rewards Visa Signature or Amazon Prime Rewards Visa Signature credit card to make purchases of products and services, minus returns or refunds. Buying products and services with your card, in most cases, will count as a purchase; however, the following types of transactions won't count and won't earn points: balance transfers, cash advances, travelers checks, foreign currency, money orders, wire transfers or similar cash-like transactions, lottery tickets, casino gaming chips, race track wagers or similar betting transactions, any checks that access your account, interest, unauthorized or fraudulent charges, and fees of any kind, including an annual fee, if applicable. When you earn 3% Back at Amazon.com and Whole Foods Market: If the Amazon.com account through which you apply for your card account does not have an eligible Prime membership, your card account will earn 3% Back on Amazon.com and Whole Foods Market purchases. 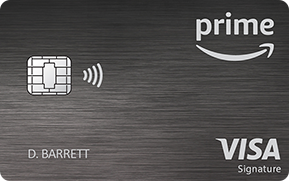 (v) is used to apply for another Amazon Prime Rewards Visa Signature card account that is approved and loaded in that Amazon.com account (that new card account will earn 5% Back at Amazon.com). Whether a purchase earns 3% Back or 5% Back is determined at the time your eligible Amazon.com or Whole Foods Market purchase is made. Earning % Back Rewards: You'll earn either 3% Back or 5% Back for each $1 of eligible purchases made using your card account at Amazon.com and Whole Foods Market, as described above. 3% Back equates to $0.03 in % Back rewards, which is equal to 3 points, for each $1 spent. 5% Back equates to $0.05 in % Back rewards, which is equal to 5 points, for each $1 spent. 3% Back or 5% Back is earned only on purchases made at Amazon.com (including digital downloads, Amazon.com Gift Cards, Amazon Fresh orders, Amazon Prime subscriptions, and items sold by third-party merchants through Amazon.com's marketplace) and Whole Foods Market (including physical Whole Foods Market and Whole Foods Market 365 stores, and the website accessible at www.wholefoodsmarket.com). 3% Back or 5% Back is not earned on (i) purchases from merchants using Amazon Pay, (ii) purchases made at international Amazon retail sites (including but not limited to Amazon.ca, Amazon.co.uk, Amazon.de, Amazon.fr, or Amazon.co.jp), or any other website operated by Amazon, (iii) purchases made at international Whole Foods Market sites, (iv) purchases of Whole Foods Market or Whole Foods Market 365 products or services through third-party sites such as Eventbrite, Instacart, Google Express and Shipt, (v) online purchases of Whole Foods Market or Whole Foods Market 365 gift cards (including through buyatab.com), event tickets or classes, (vi) purchases from certain third-party vendors operating at Whole Foods Market sites, (vii) purchases of massage services at any Whole Foods Market site, or (viii) purchases from Spa@Ink, in each case in Amazon's sole discretion. You'll earn 2% Back for each $1 spent in the following rewards categories: restaurants; gas stations; drugstores. This equates to $0.02 in % Back rewards, which is equal to 2 points, for each $1 spent. You'll earn 1% Back for each $1 spent on all other purchases. This equates to $0.01 in % Back rewards, which is equal to 1 point, for each $1 spent. We may offer you ways to earn bonus points through the program or special promotions. You'll find out more about the number of bonus points you can earn and any other terms at or before the time of each eligible offer. How you can use your points: You can use your points to redeem for eligible purchases at Amazon.com. You can also use your points to redeem for cash, starting at 2,000 points, through an account statement credit or electronic deposit into an eligible checking or savings account held by a financial institution located in the United States. Other redemption options include travel, gift cards, and products or services made available through the program or directly from third party merchants. Points expiration/losing points: Your points don't expire as long as your account remains open, however, you will immediately lose all your points if your account status changes, or your account is closed for program misuse, fraudulent activities, failure to pay, bankruptcy, or other reasons described in the terms of the Rewards Program Agreement. Rewards Categories: Merchants who accept Visa/MasterCard credit cards are assigned a merchant code, which is determined by the merchant or its processor in accordance with Visa/MasterCard procedures based on the kinds of products and services they primarily sell. Chase groups similar merchant codes into categories for purposes of making rewards offers to you. Please note: Chase makes every effort to include all relevant merchant codes in its rewards categories. However, even though a merchant or some of the items that it sells may appear to fit within a rewards category, the merchant may not have a merchant code in that category. When this occurs, purchases with that merchant won't qualify for rewards offers on purchases in that category. Purchases submitted by you, an authorized user, or the merchant through third-party payment accounts, mobile or wireless card readers, online or mobile digital wallets, or similar technology will not qualify in a rewards category if the technology is not set up to process the purchase in that rewards category. For more information about Chase rewards categories, see www.chase.com/rewardscategoryfaqs. Using your Points at Amazon.com Checkout (Shop with Points): Additional Chase and Amazon.com Shop with Points service terms apply. Learn more about Shop with Points by going to www.amazon.com/chaseswp. Some or all documents, services, websites (whether controlled by Chase or others) and/or correspondence may be available only in English. Cardmembers are responsible for the cost of any goods or services purchased through Visa Signature Concierge. Amazon, the Amazon.com logo and the smile logo are trademarks of Amazon or its affiliates.